Breaker Beach 502 - Ballito Central Accommodation. This newly built masterpiece is set on a prime landscaped sub-tropical beach front stand on the Dolphin Coast. Ballito Manor offers all the convenience and security of modern apartment living combined with a relaxed coastal lifestyle. Your upmarket two-bedroom apartment is fully air-conditioned and is located on the fifth floor of the exclusive Ballito Manor complex. 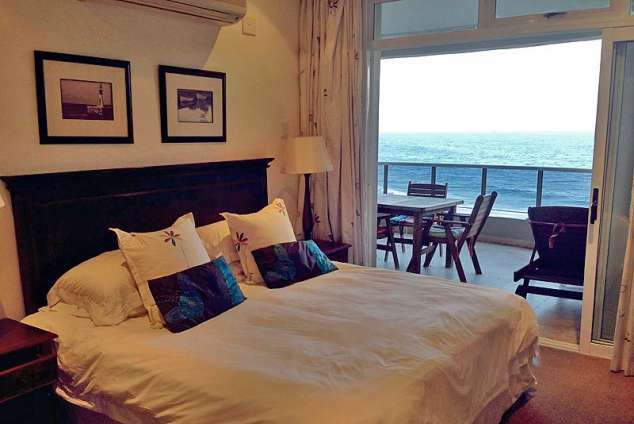 The apartment is situated on Ballito's main Blue Flag beach and has spectacular sea views. It's north-easterly aspect that tracks the daily course of the warm sub-tropical sun ensures enough sun and light to enter the apartment. The apartment boasts two en-suite bedrooms and a designer style sleeper couch in the lounge. The main bedroom has a king size bed and the room leads onto the undercover balcony with it's beautiful panoramic sea view. The second bedroom is as comfortable and has 2 single beds. Linen, duvets and bath towels are provided. Please bring your own beach towels along. The open plan kitchen/dining room/lounge, leads through sliding doors onto the balcony with comfortable patio furniture. The modern kitchen with breakfast nook, is equipped with a stove, microwave, fridge/freezer, washing machine, tumble dryer, dishwasher, toaster, kettle, crockery and cutlery, and is fully equipped for 6 people. The lounge has a large flat screen TV with a home theatre and DStv with full bouquet viewing. Enter through the controlled gate and manned security entrance which provides regulated access to the complex reception areas and park your vehicle on one of two dedicated undercover parking bays. Spacious lifts will take you to the fifth floor where the apartment awaits you. In the landscaped garden is a beautiful fenced swimming pool area with clubhouse facility (outside braai etc). This complex boasts the highest degree of modern security to ensure your holiday is a truly relaxing experience. An electronic safe is provided for your valuables. Please Note: Definitely NO SMOKING inside the apartment. Lovely large patio with Gas Braai overlooking the beach with outstanding sea views and patio furniture with seating for 6 guests, and a sun lounger. 88978 page views since 09 Jul, 2009. Last updated on 09 Apr, 2019.